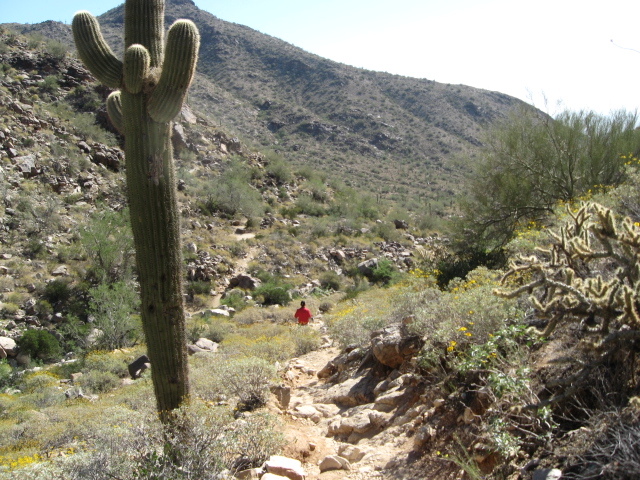 I called my brother last night and suggested Sunday morning would be a good day for a desert hike. Being as persuasive as I am, I talked hiim into it, and I reached his home in Avondale by 7:30 in the morning. By 8 a.m. we had reached the desert park, and were planning our trip. Brian commented that we should be careful–this was perfect snake weather. I said I hoped we saw one. 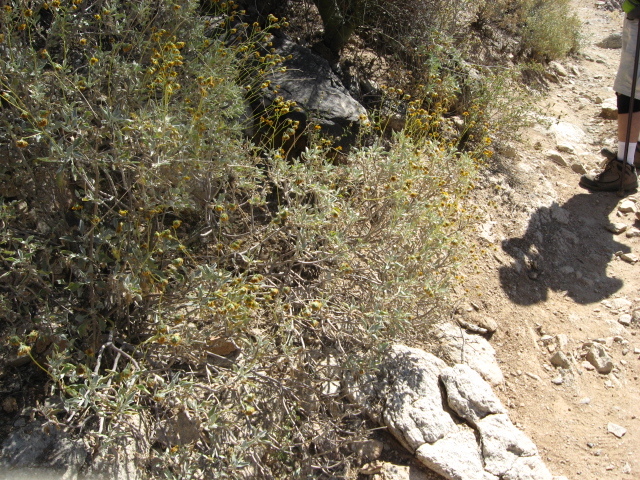 For all the times I’ve gone walking in the desert, I’ve never actually encountered a rattlesnake. 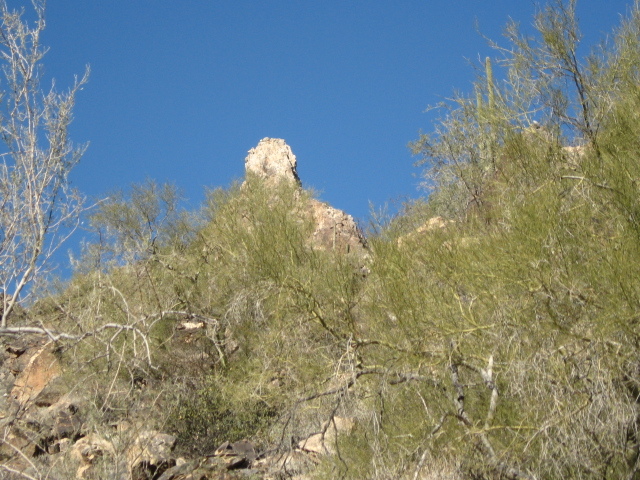 This rock tower was our target. Didn’t know if we could walk that far, but it gave us a landmark to aim at. We had already walked about a mile before I took my first picture. 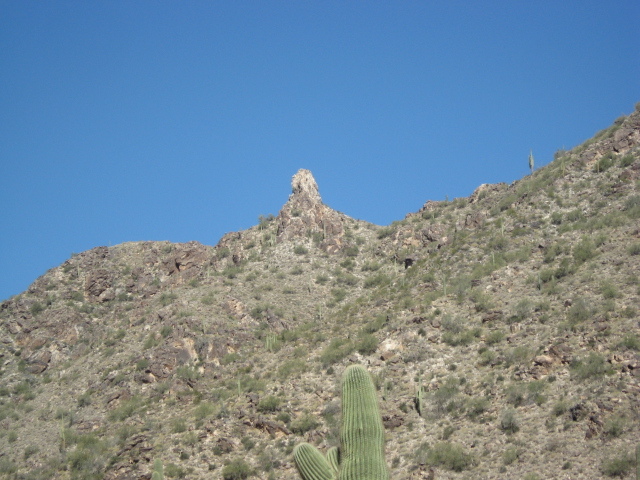 That granite tower in the distance is not as near as it looks–my camera isn’t very fancy, but it does have a built-in telescopic lens that makes things look about 3 times as large as they are to the naked eye. 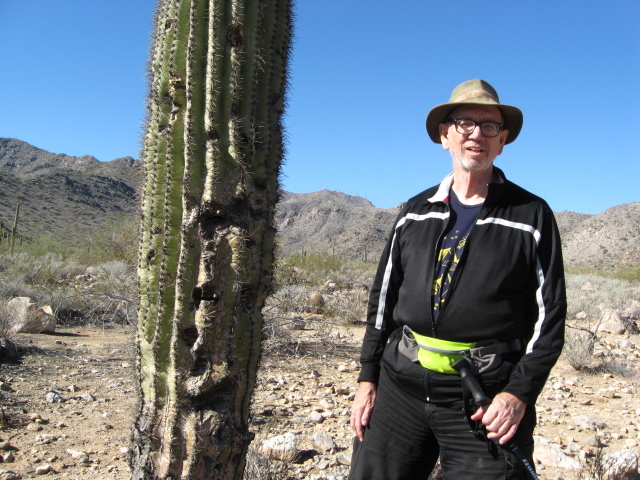 I am a fool to dress this way for a desert walk. 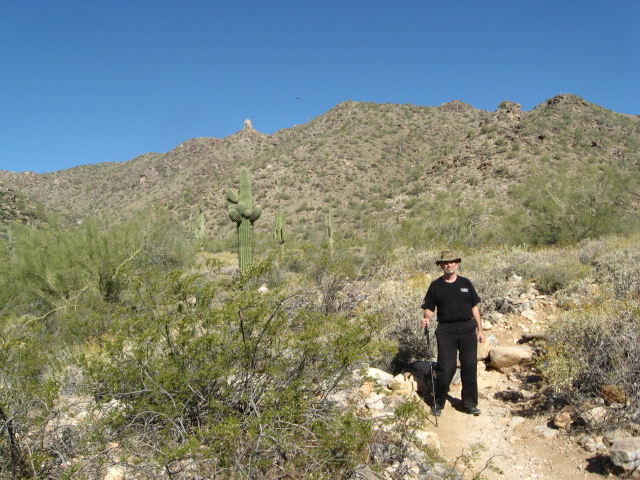 Black is not the color one should wear for an Arizona desert walk, but it isn’t too hot yet–mid 80s, and I like black, so I wear it even though I know better. This is living. 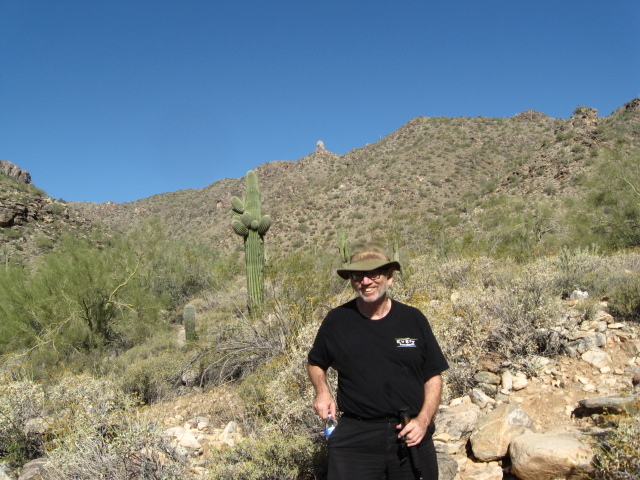 I’m about as happy as I ever get when I’m out in the desert or any wilderness, just enjoying nature and exploring. I am vain so I try to get my pictures taken without my glasses on, but Brian took a second shot I wasn’t expecting. I had put my eyes back on and was pulling the water bottle out of my pocket for the first drink on the walk. 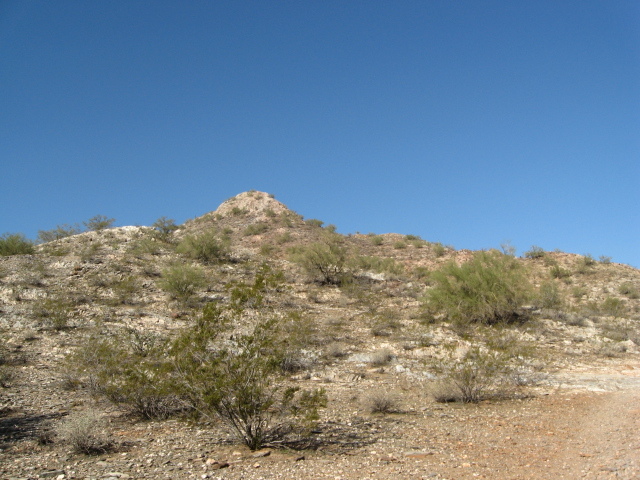 Desert view, looking uphill. Brian is leading the way up the trail. Most of the time, you hike single file. 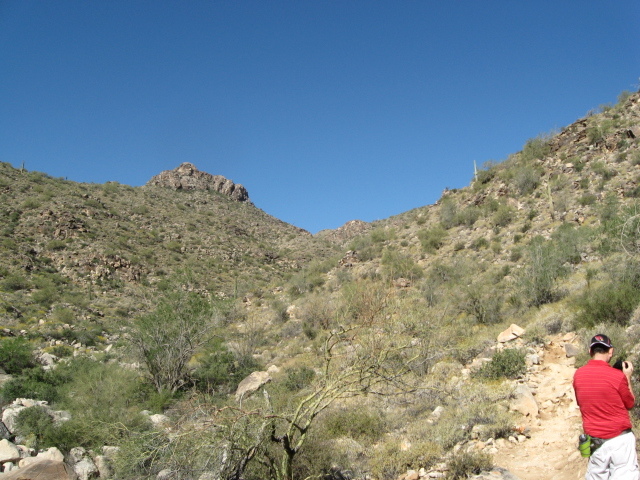 This is a good trail for hiking, but there isn’t room to walk side by side. The granite tower is a lot closer now. It looks like it might almost be reachable. I stop and look back the way we’ve come. We have been climbing steadily. That haziness in the far distance is the city of Phoenix. 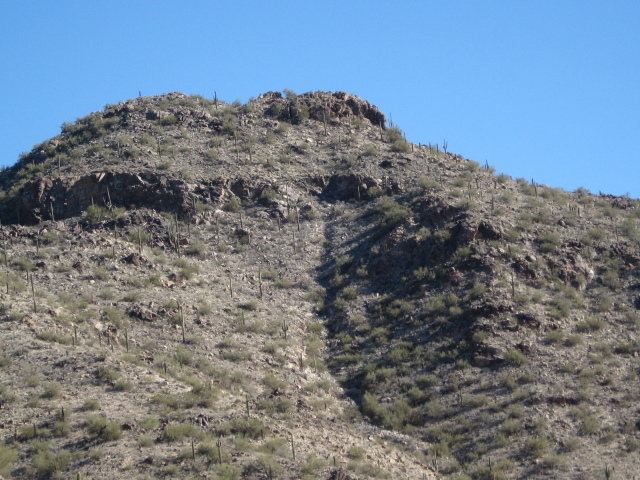 It’s a good ridge line off to the left. 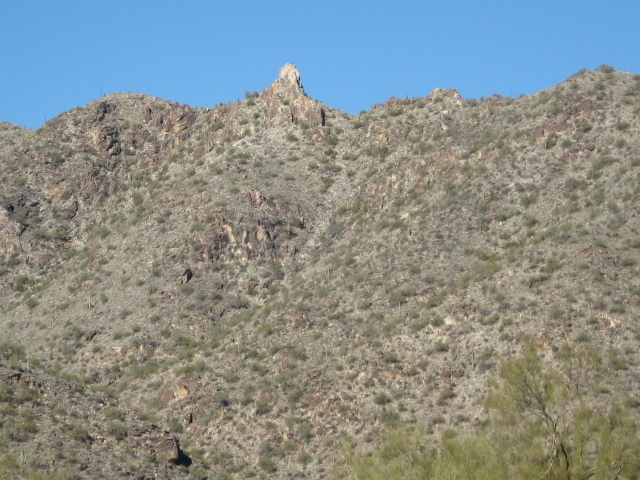 One almost expects to see a group of Apache warriors sitting up there on their ponies. Suddenly, I hear Brian say, “Snake, watch out!” It wasn’t exactly a yell, but his voice did get louder. He was in the lead, and walked right past the snake and heard it rattle. He stopped me from walking into its path. Probably the fact that he walks pretty fast got him past the reptile before it could strike. He heard it rattle–the noise isn’t exactly the clicking of a castanet, more like a whirring noise, turned and saw it. He’s very good at spotting desert wildlife. I had a hard time seeing the snake. 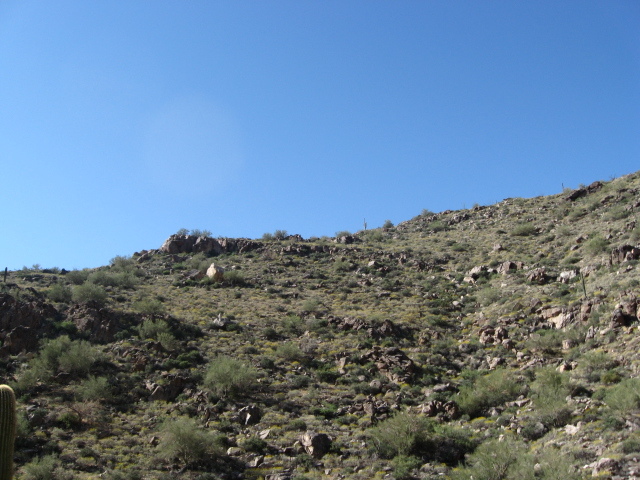 I was very cautious, walked way around the snake on the left side of the trail, even climbing on top of some boulders to keep me well beyond its strike range. 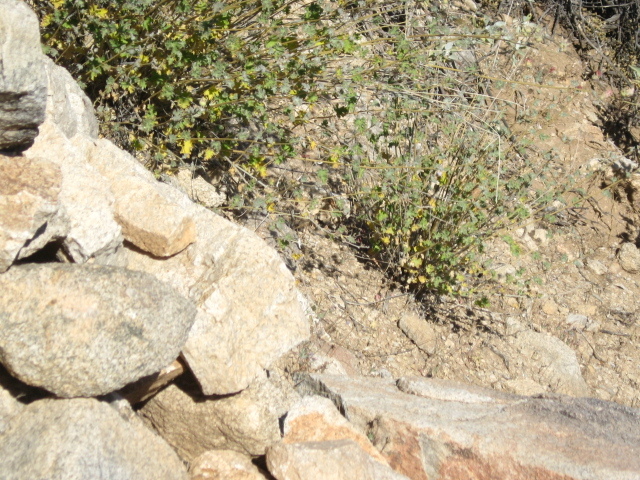 The rattlesnake is coiled in the shade of a little bush by the side of the trail. It’s a diamondback–the same animal that is the motto of our Phoenix big league baseball team. 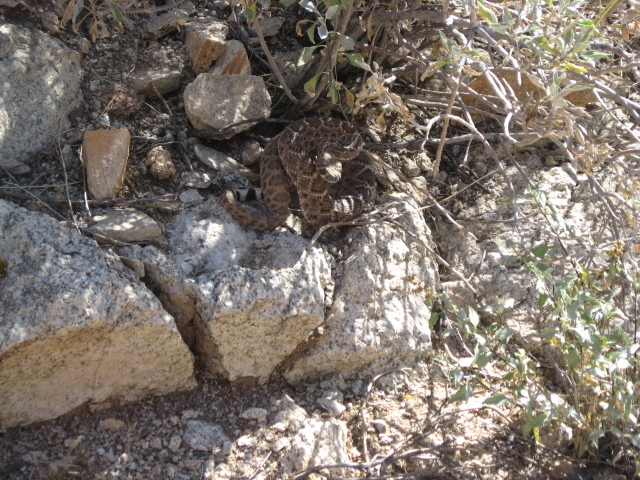 The diamondback rattler is one of the deadliest animals in the desert. Its poison can kill a grown man in an hour or two and is extremely painful. We carefully worked our way around the snake, and made a note of where it was for our journey back. We met another hiker coming down from the other direction, and warned him. We probably spent about ten minutes with the snake. He wasn’t very happy to see us, but he never struck. I got my wish. I saw a snake in the desert. I would see it again on the way back down the trail. We ran out of time. The plan was to walk in for an hour and then out for an hour. 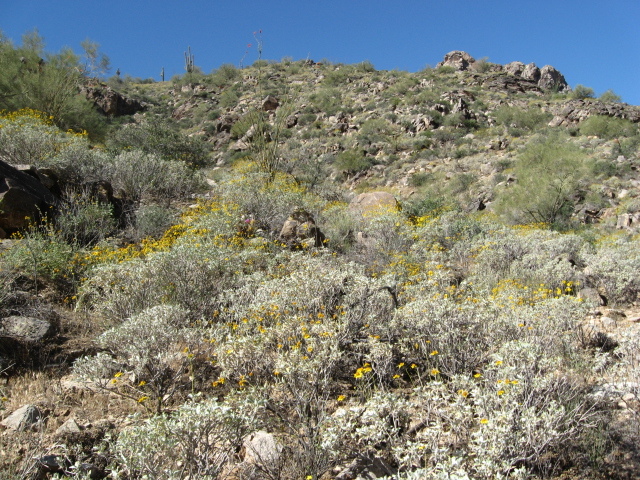 At our turnaround point I saw this exuberant patch of desert daisies–the camera doesn’t really capture the brilliance of the hundreds of yellow wildflowers growing at this point on the hillside. 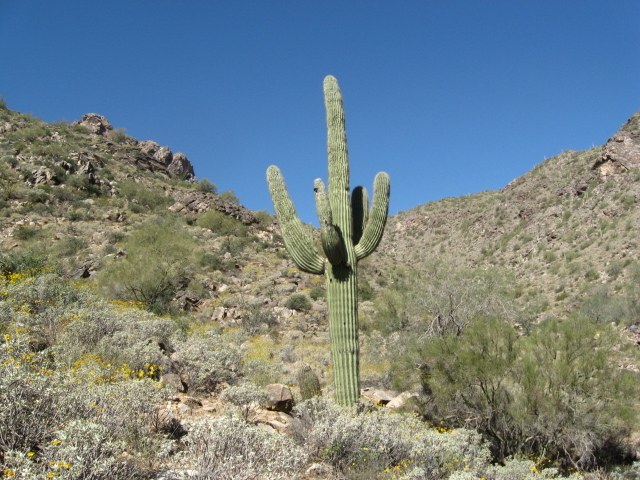 The Arizona desert is famous for its Saguaro cacti. This is a fine healthy specimen. In the center of all the green and yellow is one passionate splash of pink. 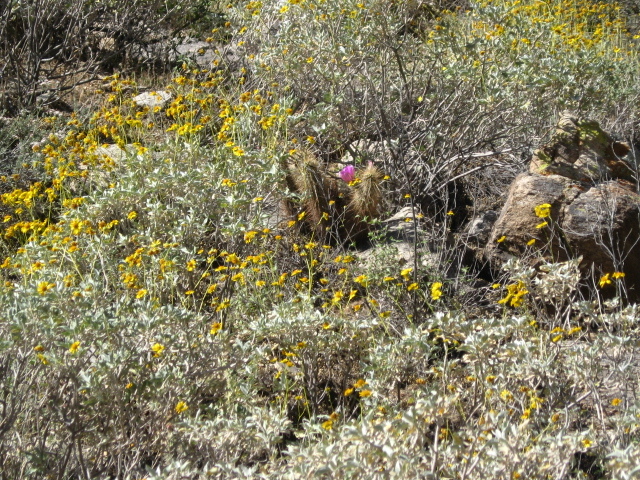 That is probably a cactus bloom, but I couldn’t get close enough to tell for sure. I liked that contrast. This picture is an accident. Camera in hand, I accidentally clicked while it was pointing down. By this time we’ve been hiking for about 90 minutes. I’m getting tired and the bottoms of my feet are getting sore. I wear tennis shoes, but they’re not really perfect for desert walking. Brian is getting pretty far ahead of me. The trail is at its roughest here, and one wants to step very carefully. We are back at the snake’s bush. The shadow is Brian’s, and he’s watching the snake and talking me past it. 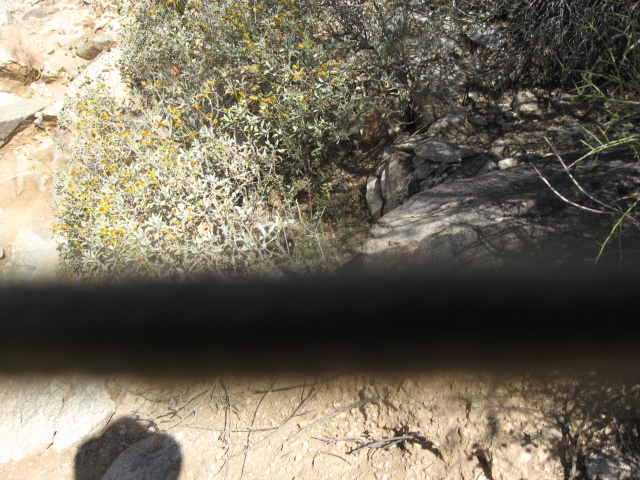 I’m aiming my camera at the bush and hoping to get another shot of the diamondback. I think you can spot it just past the black rock in the center of the picture. Its camouflage is excellent. Looking back, I’m past the snake now, but would like to get one more picture of it. You can see the shadow of my hat, better than you can see the snake, but it is in the top right part of the picture. The snake is far behind us now. 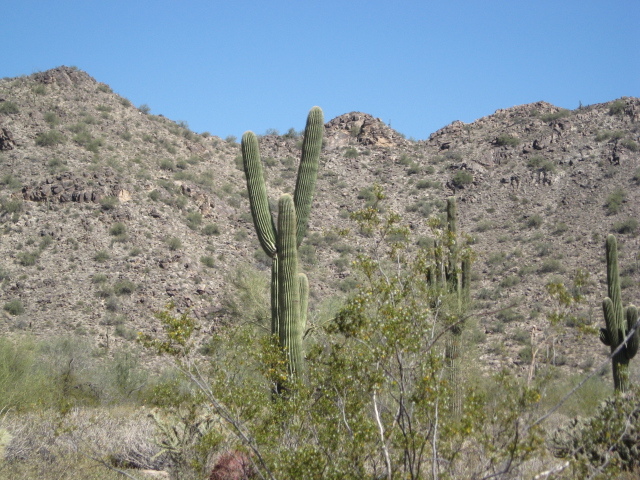 The most interesting things in the desert are the saguaros. This is a very tall one. 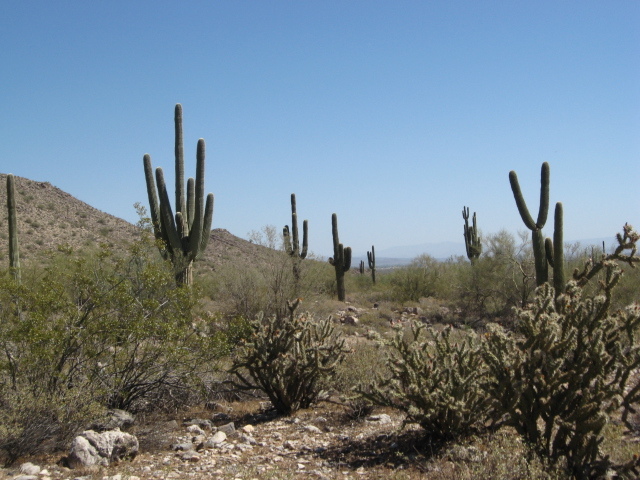 This is a veritable forest of saguaro cacti. The one on the right has grown strangely to form the letter U. 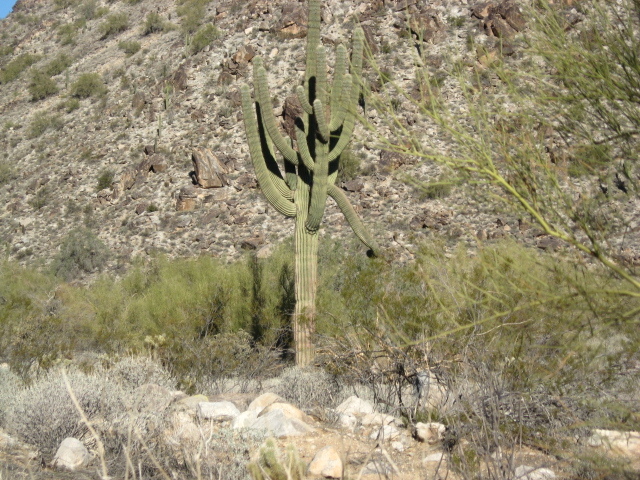 Just the right angle to see the cactus in front splitting the U of that weird saguaro. Back at the parking lot, the hike is over. 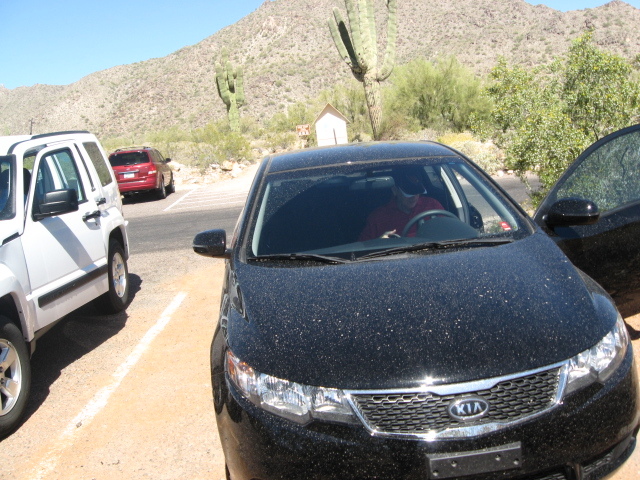 My black Kia is covered with dust spots from the shower we had about 3 days earlier. 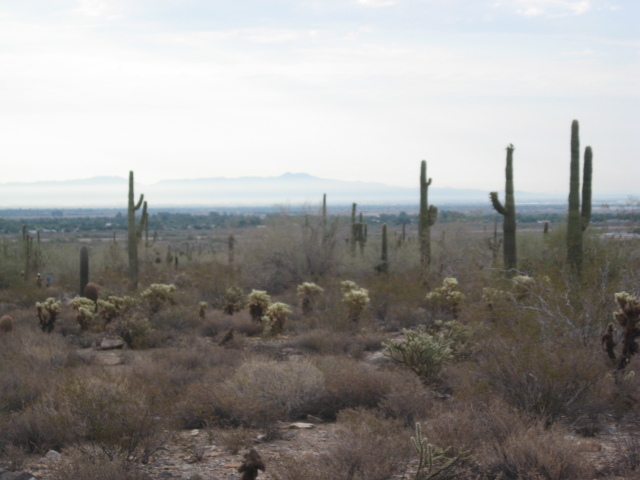 When it rains in Phoenix, it brings dust out of the atmosphere. Rain doesn’t make you clean in Phoenix, it makes things dirty. 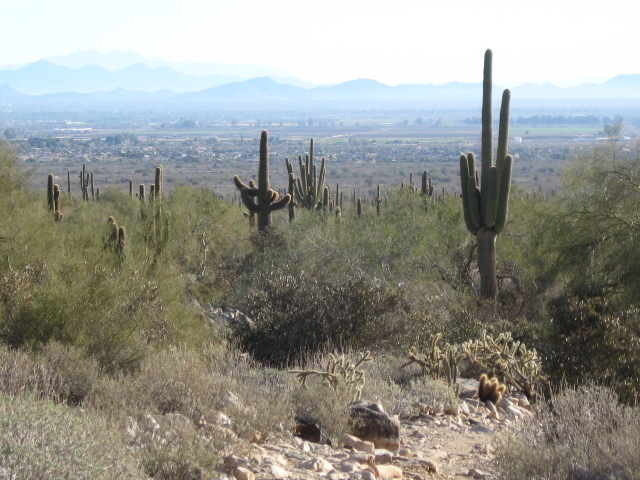 And so we say goodbye to the great saguaro forest of the White Tanks mountains. My hike is over. We walked somewhere between 3 and 4 miles. 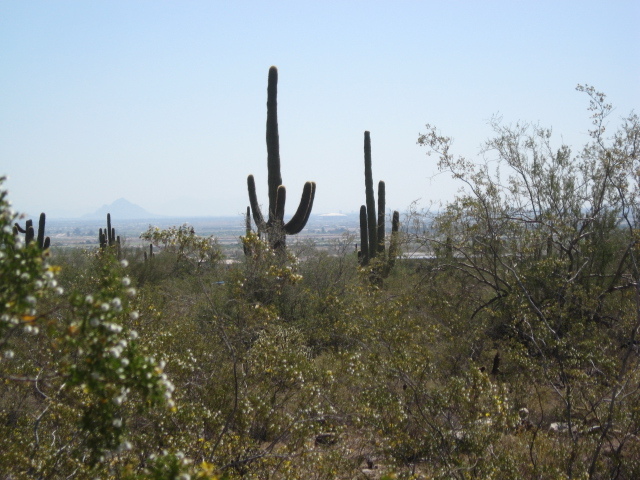 Looking back at town, you can see Camelback Mountain in the far distance–it is the highest peak in this part of the state. 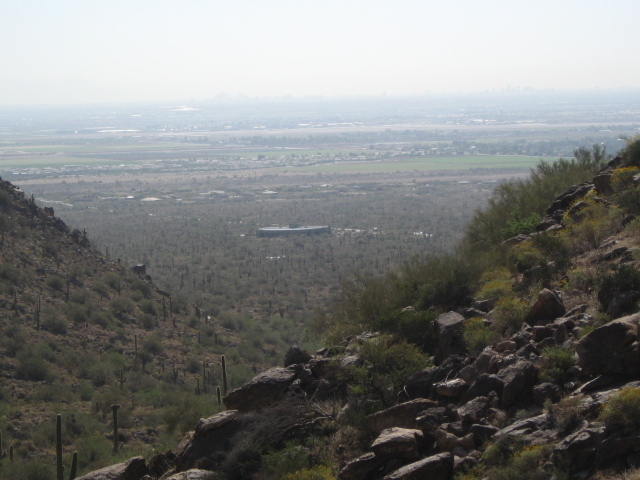 The white triangle you see is the domed roof of the football stadium for the Arizona Cardinals, located west of the small city of Glendale, which is northwest of the city of Phoenix. It’s a massive structure–more than ten miles away in this picture and still easily visible. I’m tired and satisfied. You’ve just done another desert hike with me, Ken St. Andre. If you’ve ever been face to face with a rattlesnake, or any other scary reptile, why not leave a comment? Ha! 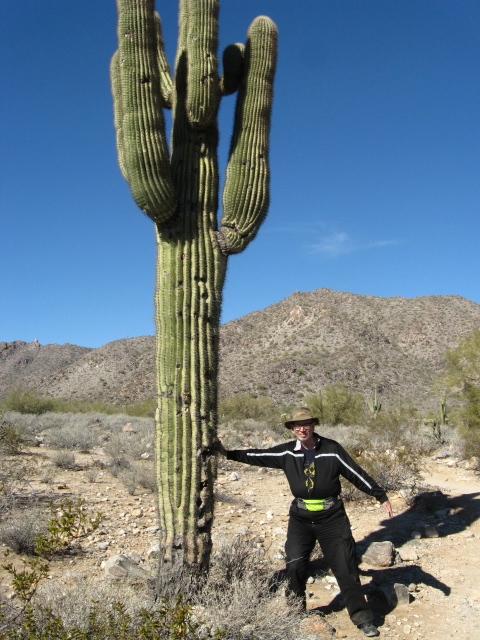 Just to show you how tough the Trollgod is, here’s a picture of him leaning on a saguaro cactus. 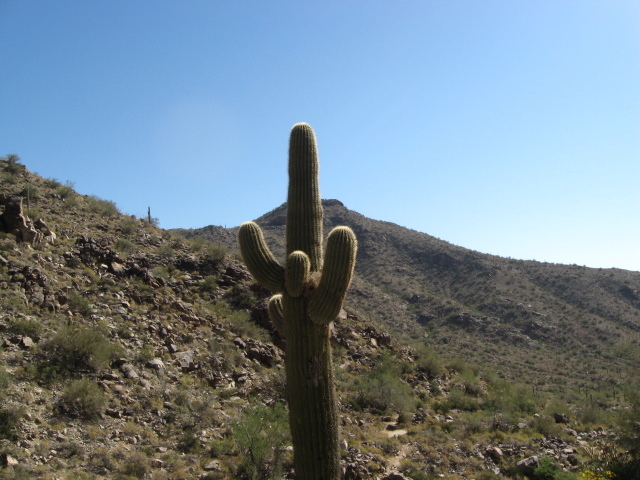 There’s an idea for a new Tunnels and Trolls monster–cactus trolls. Big, green, and covered with thorns . . .
Trollgod leans on a cactus. Sunday was a beautiful day in Arizona. 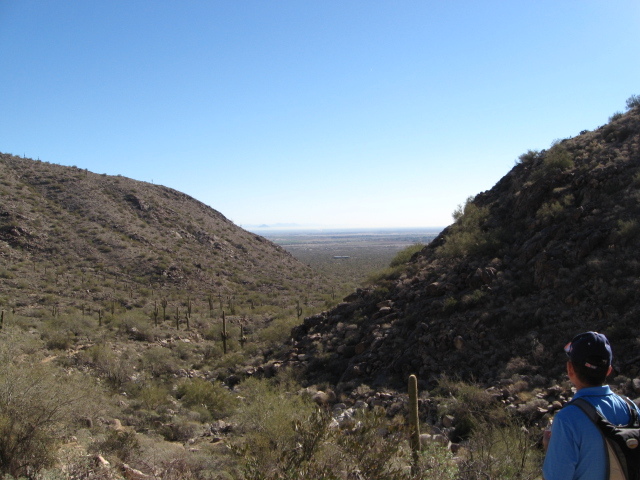 I got together with my brother Brian (5 years younger than me and in much better shape), and we went out to the White Tanks Mountains about 30 miles west of downtown Phoenix. 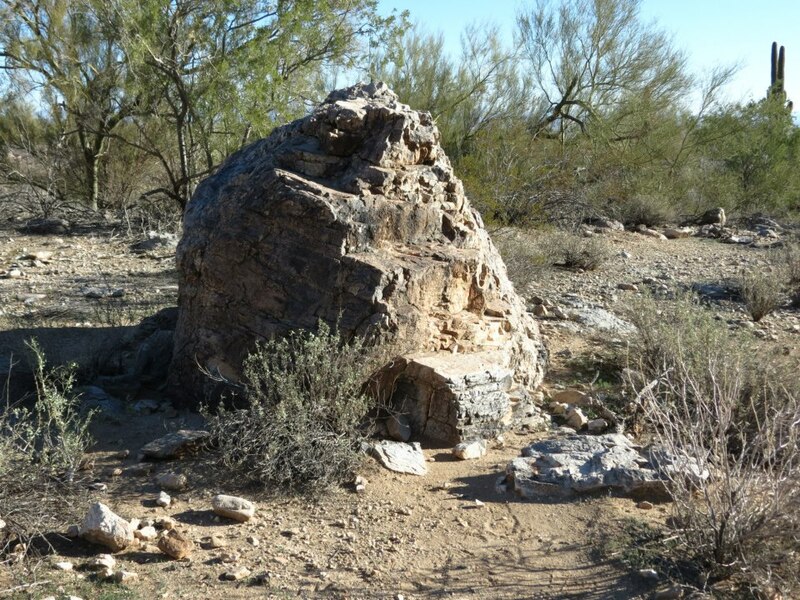 They are really just hills, running up to perhaps 2000 feet above sea level and 1000 to 1500 feet above the valley floor, but they are a great place to hike with well-maintained trails and a very scenic desert. We had about a 2.5 hour hike, did between 4 and 5 miles overland, up and down. My feet were sore and I was getting a little tired by the time I got back to the car. You’d be pleasantly tired too, if you went on this hike with me. 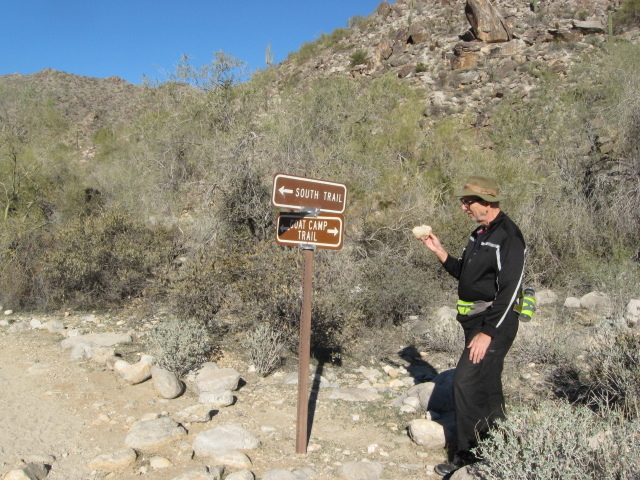 This is Brian at the signpost. 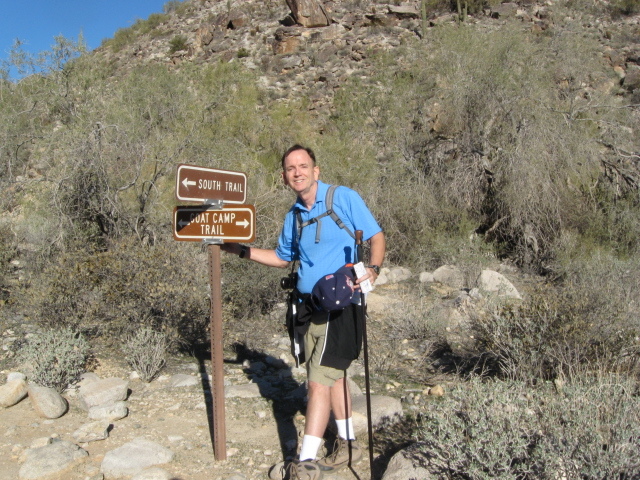 He has better hiking equipment than I do–always wears cutoffs, has a heartbeat monitor, better shoes. He has been acting as a trainer for me, sets a pace that gives me a good workout without killing me. He also makes it possible for me to get the occasional picture of me out in the desert. You know, it is great to have family or friends to do things like this with. The rest of the pix are just scenery. We didn’t see much wildlife–some hawks closer to the city while we were driving out to the mountain park, one little lizard sunning itself on a rock, and a couple of birds. I think it was too late in the morning for them–already around 10 a.m. when we took these photos. Rough terrain. 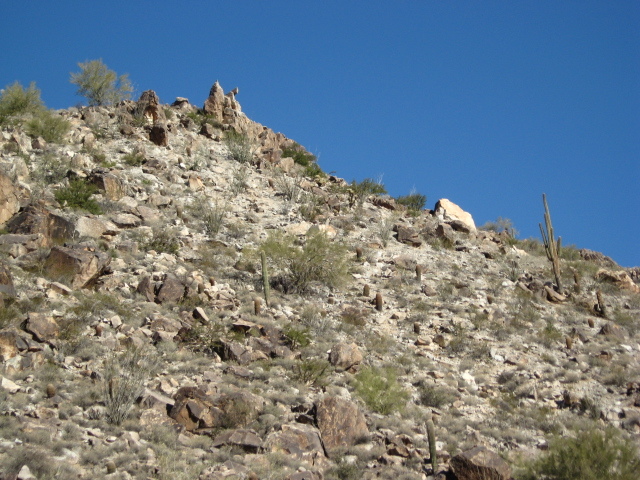 White rock (mostly granite which is largely made of feldspar and quartz) that gives these hills their name. The true beginning of the trail, before us and small parking lot behind. 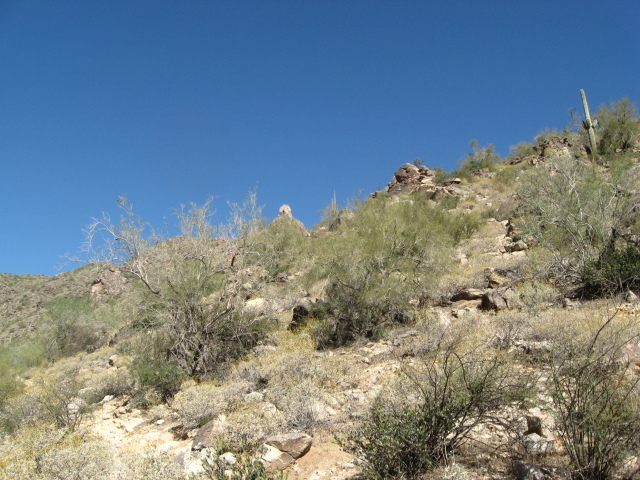 You can see how clear and blue the Arizona sky is out here in the wilderness. Further down the page I will show you a shot looking back at the city of Phoenix, and you can see what a million cars do to the atmosphere. 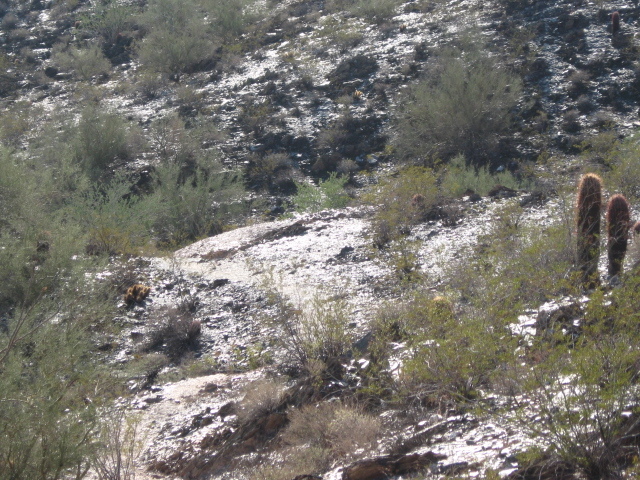 There was a sign at the park entrance telling us to watch out for mountain lions. We would have really liked to see one, but no such luck. My eyes are always drawn to the skyline when I’m hiking. 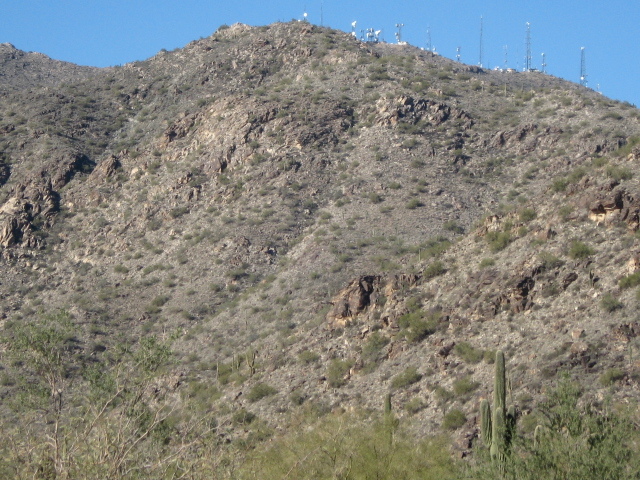 This is the highest peak in the neighborhood, and the top of it is covered with microwave and radio transmission towers. You see these repeater stations all over the southwest. The fact that there are towers on top of the mountain means there must be a road leading up there, but it doesn’t come from anywhere on this side of the hills. That white needle of rock near the center of the photo became my goal for the hike. It’s kind of strange compared to the rest of the landscape. Here I am looking back toward the city. See how hazy and dirty the air is over the populated area. Still, it’s not bad–there would be a lot of dust in the air of a desert like this even if we didn’t have 3 million people living here. 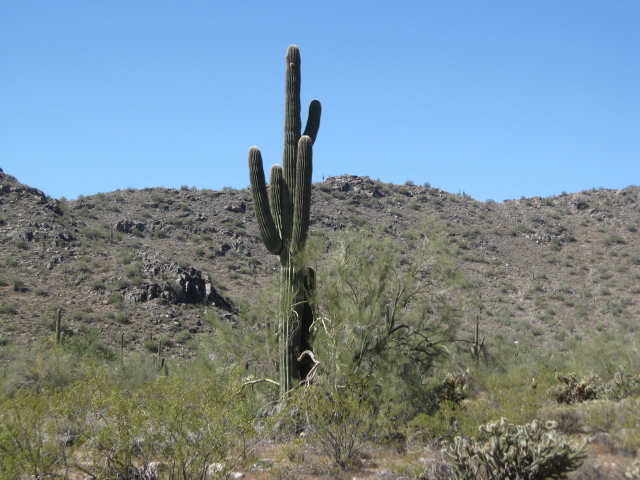 Saguaro country–these desert giants are the most impressive of all cacti, imho! Brian and I both brought cameras on the trip. He is the better photographer and has the better camera, and he took more pix. You can find his whole set on Facebook. I don’t usually upload my stuff there. I’ll be putting a few of his shots in with mine to help chronicle the trip. Nature is friendly out here, and offers the hiker a natural place to sit down and rest a bit. It would be a good climbing rock, also. Next time I come out here, perhaps I will get a picture of me standing on top of it. Big rock. 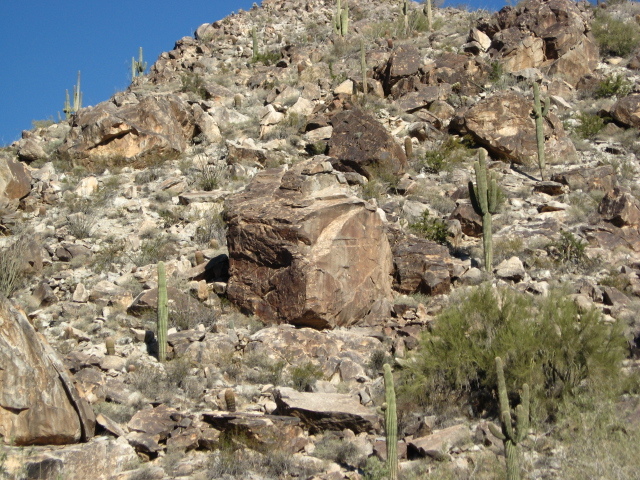 There are some truly huge boulders out here, and they are making their way downhill. It might take them a million years to reach the bottom, but a million years isn’t so long in the lifespan of a mountain or a big rock. Sky line . . .
Heh, a little planning can work wonders. Here I am, halfway through the blog, and I notice that the picture size is set to medium. By increasing it to full size I can give you all a better view of the desert. I’ll do that for the rest of this photo essay. but I’m not going to go back and change everything–just the important shots. That gully/trench goes almost straight up the mountain. If I were looking for wildlife, I’d concentrate on such places. There is more water and shelter there. This is as close as we got to my goal. 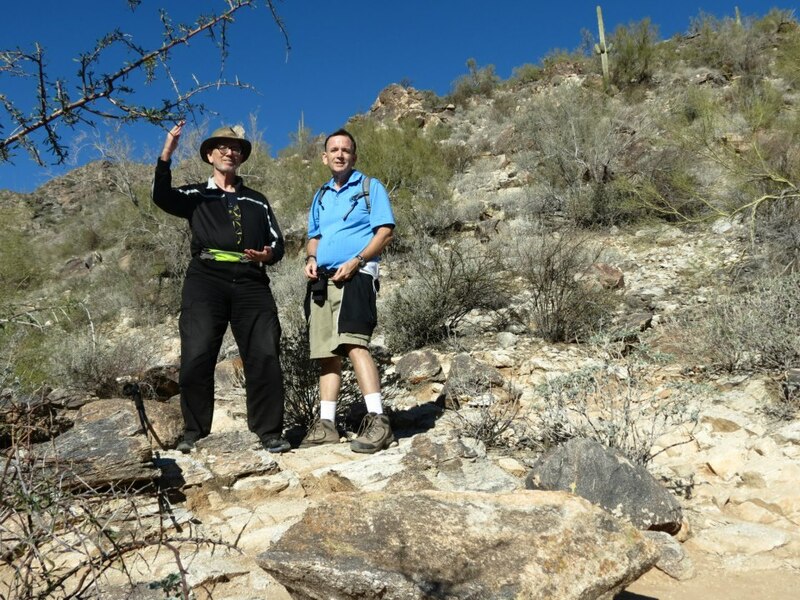 The climb has become pretty steep, and we’ve been walking for 90 minutes–time to head back. Black and blue. Brothers in action together. Brian can set his camera to take a delayed shot, and so he got this one of both of us at our stopping point. While I was resting at the top of the climb, I took the opportunity to do a little Tai Chi. This is the Cloud Hands (wave hands like clouds in the sky) posture from the beginning of the Tiger Mountain exercise. That’s a good one for doing on a mountain as one doesn’t have to move one’s feet when switching from posture to posture. We are actually up pretty high. Here is another shot looking back towards the city. Compare it to the earlier one, and you can see how much higher we are. We’re still only about halfway to the summit, but we don’t have enough time or personal endurance to go all the way today. This is almost the end of the trail. There is still a quarter of a mile to walk back to the car, but we have reached the paved road. The walking stick in my hand is my Longest Night present from Brian, and is one of the best things he has ever given me. Desert terrain is uncertain at best. It really helps to have a good walking stick to steady oneself when a rock turns underfoot or you catch your toe or heel on some projection and start to stumble. Putting the desert behind us, we returned to civilization, had lunch, and watched the San Francisco 49ers defeat the Atlanta Falsons in the NFC championship game. San Francisco 28, Atlanta 24. A balanced effort from San Francisco with 2 touchdowns in each half of the game, but a collapse from Atlanta who started strong with all 24 points in the first half, and no score in the second. All told, it was a very pleasant Sunday for me on January 20, 2013. I hope you had a good day, too. 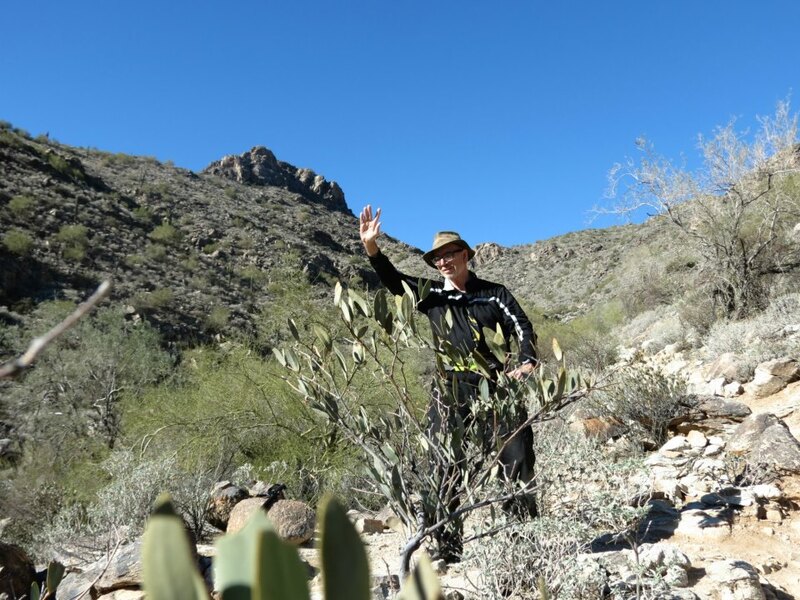 On Sunday, July 15, I got together with my brother Brian and went off for a morning hike in a part of the desert where I had never been before–the White Tank Mountains west of the Phoenix area. Although it was hot and humid, I had a pleasant hike and learned a few things I had not known before. Sky Islands–dust and smog in the atmosphere can make distant mountain peaks look like they are floating in the sky.